It's safe to say that Dallas Mayor Mike Rawlings surprised all with an announcement that the city had submitted a bid to host the 2016 Republican National Convention. Dallas slid in under the wire. Its bid was shipped to Washington on February 25 and hand-delivered to GOP headquarters one day before the February 26 deadline. Most City Council members were only recently made aware that Rawlings and former U.S. Sen. Kay Bailey Hutchison were recruiting members for a hosting committee in Dallas. The names have not been disclosed, and the contents of the bid remain confidential. So why the last-minute pitch? Phillip J. Jones, president/CEO of the Dallas Convention & Visitors Bureau, says that it came down to venue. 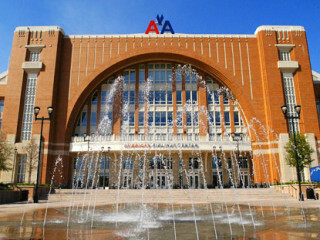 Dallas changed its tune after learning that GOP leadership would consider the American Airlines Center. "It's an ideal venue for a large convention," says CVB CEO Philip Jones. "We considered participating in the bid process early on," he says. "However, the Kay Bailey Hutchison Convention Center [Dallas Convention Center] was already booked." They changed their tune after learning that GOP leadership would consider the American Airlines Center. "It's an ideal venue for a large convention," Jones says. "With that knowledge, we decided to pursue it." A spokesman for American Airlines Center said that management could fast-track and get the venue ready in two weeks — four weeks less than the six weeks the Republican National Committee says it needs. Dallas hosted the GOP convention in 1984. North Texas is already slated to host both state conventions in 2014: The Republican convention takes place June 5-7 at the Fort Worth Convention Center, and the Democratic convention is June 26-28 at the Dallas Convention Center. Jones says that Dallas has matured significantly over the past several years, with five professional sports teams, shopping, dining and a growing arts district. "We plan on showing the selection committee the New Dallas," he says. The convention would bring in more than 50,000 delegates, journalists and other attendees. The Star-Telegram estimates that the event would require 96,000 hotel rooms during the entire convention, including 16,000 rooms on the peak night. Although other cities in North Texas weren't involved in the bid, an event like this would have a beneficial effect on the entire area, says Dallas City Council member Lee Kleinman, who represents District 11. "Events of this size are a great economic driver as they fill hotel rooms, restaurants, entertainment venues and other facilities," he says. Other cities in the running include Las Vegas — a front-runner given its world-class experience catering to tourists — and Denver, which successfully hosted the 2008 Democratic convention that nominated Barack Obama. Dallas boasts the second-largest number of hotel rooms among the competing cities, something that's been an issue at past GOP conventions, leading to disgruntled attendees trekking several miles to events. Other bidding cities include Phoenix, Kansas City, Cleveland, Cincinnati and Columbus. The convention is slated to take place between June 27 and July 18. The Republican Party's nine-member site-selection committee begins reviewing bids on Monday, March 3.